All you need to make these delightful biscuits is a mixing bowl, some measuring utensils, a baking sheet and half an hour. How can you beat that for fast? Preheat the oven to 375°F. Lightly grease or line a baking sheet with parchment paper. In a large bowl, sift the flour, salt, sugar, nutmeg, and baking powder together. Work the butter into the dry ingredients, using your fingertips or a fork or pastry blender. Mix the eggs, yogurt, and almond extract. Stir this into the dry ingredients. Add the peaches and stir just until mixed. Liberally flour the counter and your hands. Put the dough on the counter and pat it into a 1" thick rectangle. 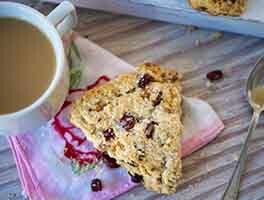 Cut dough into 10 triangular scones. 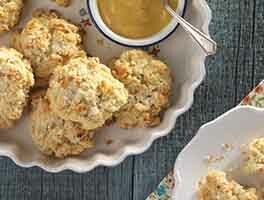 Place scones on prepared baking sheet. Brush with the melted butter and sprinkle with the sugar. Bake for 20 minutes, or until nicely browned and a cake tester inserted into a scone comes out dry. Store, well-wrapped, for 2 days or freeze for up to a month. 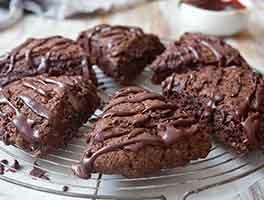 This is one of my favorite "go to" recipes when I want to bake a treat for my office staff. Love the nutmeg-peach combination. I have often substituted mango for the peaches with equally good results. These are amazing. I made them two days in a row because I had fresh peaches from the orchard. My daughters co-workers said I could send more in any time. I used a heaping 1/2 tsp. fresh grated nutmeg, 1/4 tsp.allspice and 1/4 tsp. cinnamon in the recipe. I used Irish butter, which I freeze for a little while and then grate in, so much easier . When I cut up the fresh peaches I did lay them on some paper towels because they were so juicy I was afraid it would to much moisture for the scones. I patted the dough into about an 8 inch circle cut it into 8 wedges( which I left in place).Don't forget the sugar on top. They baked in 18 to 20 min. 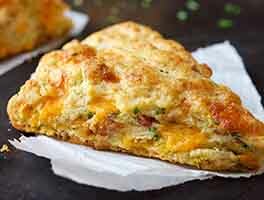 They make a nice light scone, with great flavor. I made my own spread for them by whipping some cream cheese and a really good jarred peach preserve together. Loved these! I patted the dough into a 1"-high round and cut it into 6 big scones (baked for about 30 mins). Not too sweet, lovely flavor. This came out great. I never made scones before. 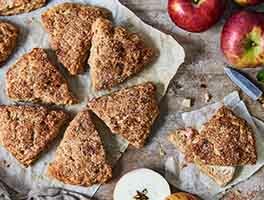 When I used to live in vermont I'd buy some peach scones in essex jct that had peaches in the middle kind of like a pie. Next time I make this I'll try to sandwich some peaches in the middle. I used KAF white whole wheat flour. The scones came out so soft and lovely to eat. And the sugar and peaches blend well, so it's not too sweet. Definitely a keeper!